Nokia's publicity stunts for the N8 are never-ending. 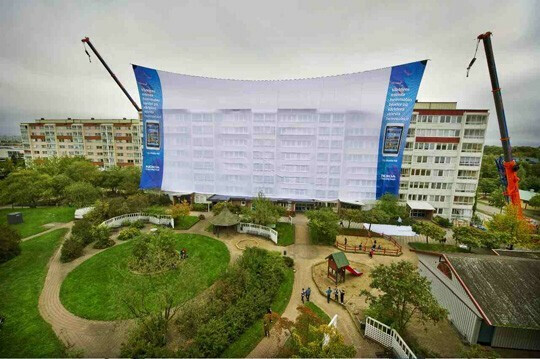 In an effort to show the video output prowess of Nokia's pride and joy, its Swedish team pulled a gigantic movie screen in the air above the city of Rosengard. The canvas was stretched apart by two huge cranes, and spanned 51x28 meters (167x92 feet), apparently making it the largest such screen in the world, measured in square footage. 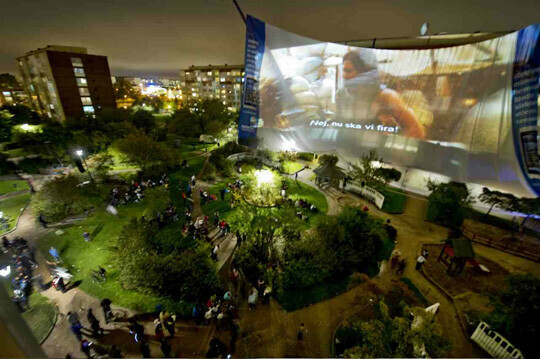 After turning their whole town in a giant drive-in movie theater, the Nokia Sweden team set up four XLM HD30 projectors, each weighing 140 kilos (308 pounds), and started beaming Prince of Persia onto the canvass. The nice part - movie was output by the HDMI port of a Nokia N8, and around 1500 people gathered to watch it with the N8's Dolby Digital surround sound, plus 1000 more freeriding from their balconies. Now we know that the N8 will clearly support subtitles, judging from the evening pictures of the giant movie screen. We are sure the other HDMI-out handsets can do this output, too, but their manufacturers are too busy with other PR stunts. Now that's what I call Multimedia Power!